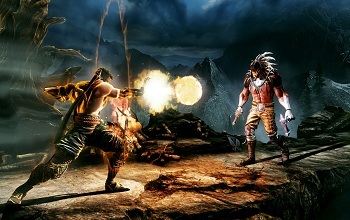 Killer Instinct is "Not Free-to-Play"
Microsoft says that Killer Instinct is "the world's most generous demo." There were more than a few fighting fans disappointed to discover that the long-awaited reboot of Killer Instinct, announced at Microsoft's E3 press conference, will be a free-to-play title that comes packaged with one playable fighter and charges players five dollars for each additional character they want to unlock. According to Microsoft however, the game isn't actually free-to-play at all, but rather, is "the world's most generous demo." Elaborating on the subject Ken Lobb, who is working as the creative director behind Microsoft's first party Xbox One titles, affirmed the company's position on the game. "Some people are like, 'oh, free-to-play.' No. It's not free-to-play." According to Lobb, a free-to-play game is "a thing you really can't ever own." He would peg Killer Instinct as being the direct opposite. "Day one, if you want to buy our game, buy it. You own it. There's no grind for little coins that unlock things later. None of that." The free part of the game, according to Lobb, is just available to "get as many people playing" as possible. That version's extremely limited nature, in turn, supposedly disqualifies it from counting as a free-to-play title. Likewise, Lobb believes that Killer Instinct's plan to have players pay for individual characters is very much different from what real free-to-play titles do. "If you buy the $40 pack, there are a couple of other little things you'll be able to buy, but you're done. It's not like there's some buy coins to unlock thing. That's why I've always said this is not a free-to-play game." Whether or not gamers will agree, however, and how their opinions will affect Killer Instinct's success, is the real question.